Diane stays ahead of the pack. 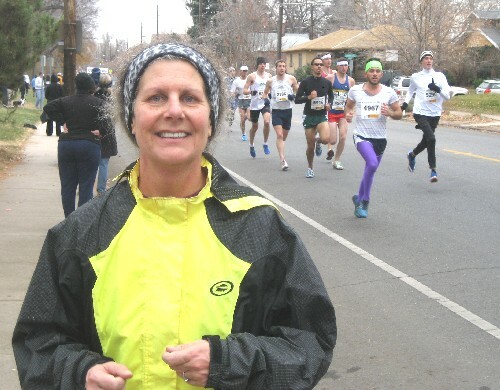 Wessel and I had a lovely Thanksgiving run in Denver. We’d planned to go alone, but then about 7,600 others joined us. We were in the Mile-High City last week visiting my longtime friend Kelley Griffin. Kel and I met when we worked together at the Patriot Ledger in Quincy, Mass., some 20 years ago (ack). She’s now news director at Colorado Public Radio. Earlier in the week, Wessel and I spied a park with a dirt running track during a drive downtown. Kel told us it was Washington Park, a city favorite for more than a century. “Wash Park” is pretty amazing. One of Denver’s nicest and largest (165 acres) parks, it has a 2.6-mile jogging path, several gardens, soccer fields, playgrounds, basketball court, horseshoe court, a lawn bowling green, 10 tennis courts, two lakes and a pond. Impressive! The best part for us was it was only a mile from Kel’s house. 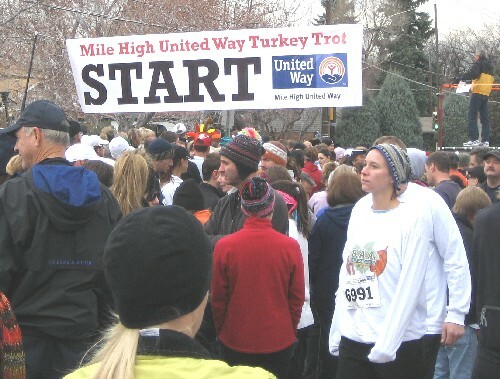 Start of Denver's 35th annual Turkey Trot. Festive trotters in turkey hats. Around the time we completed the dirt perimeter trail (there’s a shorter paved inside loop as well), the runners were about to start. 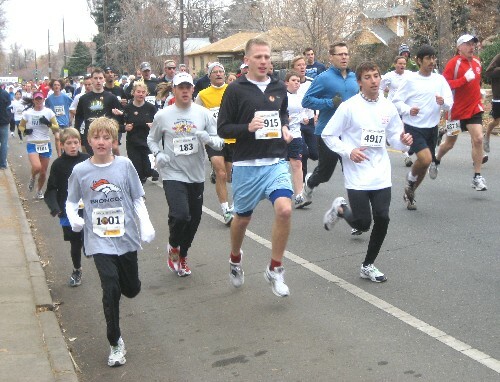 Even Mayor John W. Hickenlooper was there to cheer them on. As we watched from the side of the road, trotters kept coming and coming and coming. I read in the paper the next day that there were more than 7,600 of them. 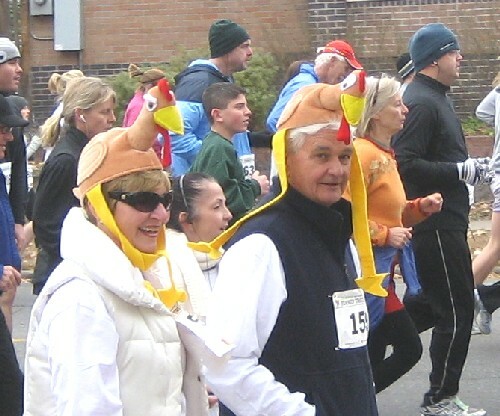 Some runners took it seriously, while others, sporting turkey hats and even turkey legs/feet, were more interested in the festivities. The things we do to make room for food.